Illustrated Kinesio® Taping manual is for the taping of adult muscles consisting of 107 pages with plastic spiral binding so it lays flat and open. Kinesio Taping Perfect manual is for the taping of adult conditions (problems) consisting of 132 pages in paper back form. 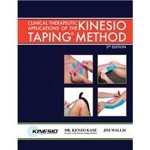 A comprehensive book explaining the concepts, theories and the newest applications of the Kinesio® Technique. With over 70 clinical applications such as shoulder instability, brachial plexus, epicondylitis, bursitis, ankle sprain, dislocations, and hand therapy techniques this is the most complete and comprehensive Kinesio Taping Manual offered in the United States. This book has colored pictures and comes in spiral form. Being praised for its unprecedented user-friendly style and full-color format. Covering conditions from infant to adolescent, focusing on the necessary foundation needed of KT applications that will enable your patients and children to live more productive lives. Nevanon model DSN-210 stainless steel scissors coated with black carbon and a fluorine resin. A 3.5 inch blade for a clean tape cut without picking up tape residue. Now comes in left and right handed and with a handy holster for taping.